Foursquare is fun but I can’t be bothered to use it too much in my hometown. I figured it was time to write the definitive guide to how I use Foursquare (or any location based app) because I have been bombarded with Foursquare requests lately and I sleep better at night knowing that people are using products and services exactly the way I do…and honestly I have been too busy to think up some interesting blogs to write. 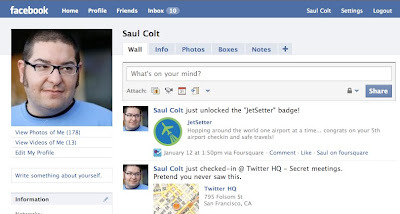 So without further adieu I present you The Not So Definitive “How Saul Colt Uses Foursquare Guide”. Maybe I am a realist or just grumpy as I write this but I need to say I could not care less about the points and badges but I do like Foursquare so because of this I have taken the following approach to Foursquare. I very rarely check in while I am in my home town because I rarely do interesting things except work and catch up on TV and people shouldn’t care when I am home on my couch…and people don’t really care when I am at work but like any content you are pushing out, people are intrigued by “interesting things” and for that reason I only check in when I am somewhere cool. I travel a lot and when I do I am always on the go and bouncing around from meetings to events and in my opinion (I could be wrong here) but it is much more interesting to live voyeuristically through adventures then day to day activities. This may be more of a comment on my life than yours so please feel free to post every single place you go because that brings me to the other way I use Foursquare. Yep, as creepy as this sounds I watch where people are. Like I stated above, I don’t care when you are sitting on your couch or in your bed and will never drop in uninvited but when I am at a conference and there are multiple events at the same time I will look to see where people are going and look for opportunities to speak to people I need to catch up with. At Airports I look for people to waste time with or split cabs. Surprisingly I don’t use Foursquare for creepy purposes but there are opportunities for that as well…I just don’t have the time or energy. Don’t get me wrong, I love Foursquare and think people should play around with it and figure out how it best works for you…and if you don’t travel etc look for ways to use Foursquare for more ways then just collecting badges because badges are for boy scouts. I kinda get FourSquare more now because its point has been evading me. Thanks dude. I understand Foursquare, but I don't see the point in getting an account since I don't travel much lately. The only places I would be checking in are home, a client place of business or Nana's. @keriCDN – Thanks for commenting and reading! I think the value of location-based marketing is in the very early stages… and apps like Foursquare, Gowalla are only scratching the surface of possibilities that will preset themselves down the road. The uses will evolve as people interact with each other much like Twitter. In a few years we will look back in wonder at the quaintness of this period of interaction via mobile. And I'm glad I was checked in at Second Cup in your screenshot and not somewhere more dicey at 3pm in the afternoon. Cheers! @Randy – The charm of Foursquare to me is in the "Tips" section. I love getting a note when I check in somewhere telling me to "Try the Veal" but that needs to be adopted more. @randy – oh and yes I agree with your comment about looking back at all of this. Interesting analogy! I like it! 1. There are friends you want knowing where you are at all times, and then there are friends you don't want knowing where you are at all times. I don't mind if my best friends who I get together with on weekends know that I'm out for dinner somewhere, but I don't need the entire city of Toronto knowing where I am. I had friend requests coming in and felt bad not accepting them, but I really only had a group of about 5 people that I wanted to know where they were at all times. Also it's a privacy/security thing to me too – I'm a young girl in a big city, and 100 people (some I've never met) knowing where I am doesn't bode well with me. 2. I think the value in Foursquare lies in checking in somewhere and finding out someone else is there, or someone checking in near you so you can drop in to visit them. This doesn't work when people are checking in at subway stations, on their couch, or on a streetcar. That is purely a way to get points and unlock badges, not for the social aspect of the game – so I don't see the point. 3. I think the real value in Foursquare lies in the tips. When I check in at a restaurant, I want to get a tip from someone who ate there and can recommend something. When I check in at the Eaton Centre I want to know which stores have sales. I think this is the future potential of Foursquare, and they're just scratching the surface with partnerships like the Metro deal announced this week. So there you have it – potential not fully realized, pointless check-ins, and safety/privacy concerns – my reasons for not using Foursquare. Hopefully one day they'll sway me back! To the credit of 4sq. they have now updated with a feature to allow you to control if you post to both Twitter and Facebook or just one or keep yourself secret. Still not perfect but I will check in places and not tell anyone often. I agree about the tips section. Without getting into a bigger discussion I think the tips section have to be adopted better or Yelp night make them redundant. Tonia at the LCBO. LOL! I like FourSquare, but don't LOVE it. Maybe I'm just bummed that I was just dethroned as Mayor of K12.